Gurdwara Sahib Kartar Kirtan was demolished within hours by the Indore Nagar Nigam (municipal corporation), who used police authority to forcibly vacate the entire Gurdwara building, and demolish it using bulldozers and excavator machinery. The local Sangat including men, women, and children, who were protesting the proposed demolition, were harassed and beaten by hundreds of police officials who were given the authority to vacate the complex by force. Several puratan Saroops of Sri Guru Granth Sahib Ji, Sri Dasam Granth Sahib ji, along with rare manuscripts and books, valuable antique Kirpans, cashboxes, a secure safe with more than 300 thousand rupees in cash was taken away by the authorities after the Sangat was removed from the premises to an unknown location and without any consultation with the Sangat or Gurdwara authorities. According to long time Indore resident, Bhai Ratinder Singh (Sr. Editor Panthic.org), Indore Municipal Corporation brought in hired thugs along with the local police who entered the sacred Gurdwara premises in shoes and forcibly stopped the recitation of Kirtan and divan proceedings, and began to manhandle and evict the men, women, and children from the complex. 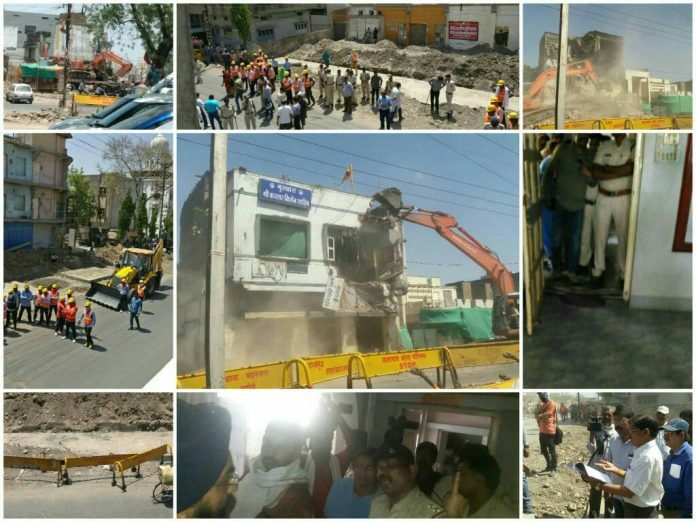 Sikh community leaders stated that the local municipal corporation along with Indore Mayor, Malini Gaud, who were spear-heading the “beautician” project had assured that the city would work with the Sikh community in working out a relocation the Gurdwara complex in compliance with the project but the Sikh congregation was shocked by the high-handed approach taken by the authorities when the Gurdwara complex was forcibly desecrated and demolished without any warning or planning.